When a person has difficulty in moving and seems to lose balance then it may be an indication of Parkinson’s disease. It is because of problem to certain nerve cells in the brain. Dopamine is the chemical that sends signals to the brain for movement. The signals lets your muscles move smoothly at the correct speed and the way you desire. When a person is afflicted with Parkinson’s then the nerve cells are damaged, which means dopamine is no longer available and thus you have trouble moving your limbs at desired speed or they may tremble involuntarily. Parkinson’s is a progressive disease and it slowly advances and gets severe over time. This happens over many years and today there are good therapies that can help a Parkinson’s patient lead a fuller life. It is yet to be found what exactly causes the nerve cells to break down. Researchers are investigating the causes which include aging and pollutants or poisons in the atmosphere. There is a probability of some abnormal genetic make-up or genes that leads to Parkinson’s disease in few people. So far there is no concrete proof that Parkinson’s disease can be inherited. There are certain marked symptoms of Parkinson’s disease like tremor or trembling of the arms, hands or legs, sometimes the patient may have stiff muscles, movements get slowed and there can be a problem with balancing while walking. Tremors are said to be the first symptom and the most common one but not everyone will have tremors to begin with. 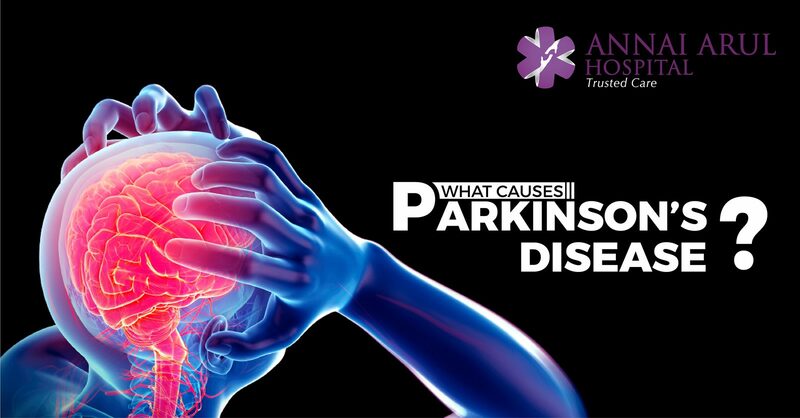 Parkinson’s also affects the muscles all through the body and cause trouble swallowing or later constipation. In advanced stages the patient will have a fixed gaze or blank expression and trouble speaking. Some people may show signs of dementia. The symptoms usually appear between the ages of 50 and 60, though there are several cases where the disease symptoms manifested earlier than that. How to treat and manage Parkinson’s? Your doctor can detect Parkinson’s by observing your movement asking for some brain scans etc. At present there is no definite cure for the disease but there are several medicines that can control the symptoms which affect your daily life. Certain specialised treatments like deep brain stimulation may also be used depending on the nature of the individual’s disease. The patient is usually advised to get good diet, enough of rest, conserve energy and sometimes given physical and occupational therapy.